Life is easier when you're wearing the right footwear. These Danner 23820 Black Men's Lookout 5.5” Waterproof Leather Work Boots are that footwear. Whether you're a policeman, an EMT, a construction worker, or just a hard-living outdoors-man, these quality work b ... (see full details) (see specifications) #DNN23820. Life is easier when you're wearing the right footwear. These Danner 23820 Black Men's Lookout 5.5” Waterproof Leather Work Boots are that footwear. Whether you're a policeman, an EMT, a construction worker, or just a hard-living outdoors-man, these quality work boots provide protection, comfort, and years of durability. It doesn't get much righter than that. The uppers of the Lookout shoes are manufactured with black full-grain leather that polishes to a high-gloss finish. The leather is combined with ripstop ballistic nylon insets that provide flexibility and strength at pressure points on both sides of the boot. The entire upper is waterproof, and measures 5.5 inches tall, so your ankle and lower calf are supported and protected, too. Waterproof Danner Dry interior liners are designed to wick moisture away from your foot, so you stay dry in all seasons. Under-foot venting is built right in for maximum airflow, and a patent-pending dual-density footbed means the ultimate in cushioned comfort. Because nobody can predict what kind of terrain – or situation – you're gonna face on a day-to-day basis, the Lookout boots are fitted with super-rugged slip-resistant outsoles with a heavy-duty lug pattern for great traction. They're also rated to meet or exceed body fluid-borne pathogen resistance standards NFPA 1999-2013 sec 13 7.4 2.7 and ASTM F1671-13. Whatever you do for a living. Whatever you do for fun. Whatever you do for exercise. Whatever you do, do it in these Danner 23820 Black Men's Lookout 5.5” Waterproof Leather Work Boots. Sometimes it really is that easy to get it right. Order your pair online from the Working Person's Store today. 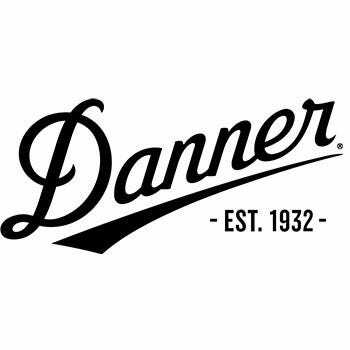 Danner Boots: Men's Waterproof Lug Sole 5.5 Inch Lookout Work Boots Danner Boots 23820 is being added to your cart.